This is one of those trick shots which can seem quite difficult at first but if you practise it you will make it very frequently. You need to take the 1, 2 and 3 balls and place them, tightly frozen together as shown in the graphic above. The 1 ball and the 2 ball should be nicely aimed to the right edge of the corner pocket. 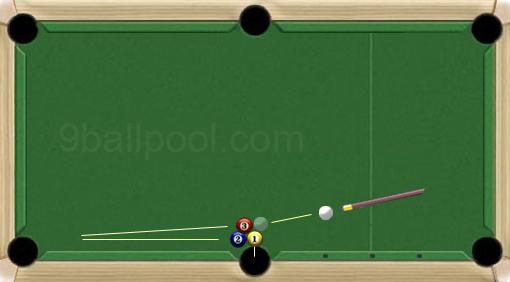 The cue ball needs to be approximately 5 or 6 inches away from the rail adjacent to the first diamond to the right of the centre pocket. You need to aim to make a half ball shot on the 1 ball with a little bit of right English or side and to play the shot medium hard. Note: it's very important to have the balls frozen together.